They arrive nameless and unnumbered by land or sea but ever-more unregulated migrants across the globe are falling victim to proliferating border-security regimes. Undesirables? 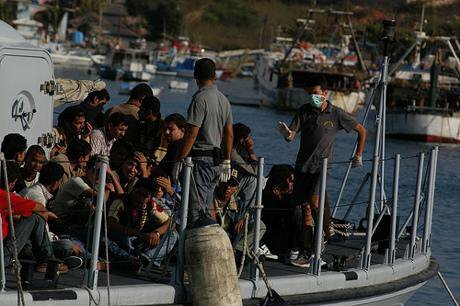 Migrants arriving at Lampedusa on the Italian coast. Flickr / Noborder network. Some rights reserved.National borders, where they existed, used to be relatively safe and easy to cross. But migration is becoming increasingly difficult, selective and dangerous. Less permeable borders are trapping more and more people in their own countries or in transit or limbo, legally unprotected and lacking social necessities. As border controls are reinforced in a globalised era of increased migration and climate change, ever-greater swathes of humanity are rendered vulnerable. The number of borders deploying heightened security measures has tripled since “September 11”. There are myriad ways to prevent cross-border migration: walls, barbed-wire and electric fences, land mines, monitoring and sniper towers, land and maritime radars, infra-red and satellite surveillance, unmanned aerial vehicles, carbon-dioxide probes and small arms carried by border guards. And as migration is securitised and borders externalised this trend can only continue. This has primarily been a European and US agenda, in which all cross-border migration has been perceived as a potential threat to be controlled, intercepted or blocked. Many other countries are however following suit in closing their borders to “undesirables”. And border externalisation creates a ripple effect as countries tighten their borders following diplomatic pressure. The European Union has put pressure on neighbouring states—not just states that abut—across north and west Africa and the middle east and central Asia, to stem the flow of migrants to Europe. All Europe’s outer borders are becoming increasingly impenetrable, with strong emphasis on the Greece-Turkish and southern maritime borders, through interception and intelligence services which include Frontex, Eurosur and Rapid Border Intervention Teams (RABITs). In north America, the US-Mexico border has packed layers of protection, along the US-Canadian border a virtual wall of surveillance is under construction and the US-Caribbean sea front is highly guarded. In north Africa, the Mauritania-Mali border is becoming increasingly closed to migrants. Morocco has controls on its Algerian border and a 1,500-mile barrier along the Western Sahara border, sown with land mines. In the south, barbed wire secures the border between Zimbabwe and South Africa and an electrified fence lines that between the former and Botswana. In the middle east, Israel has sealed the Palestinian Territories’ borders and bolstered security with Egypt. At both borders between the Oman and the United Arab Emirates and Saudi Arabia and Yemen, strong barriers are under construction. Further east, India has deployed security measures along the borders with Pakistan, Tibet, Burma and the Kashmiri region, as well as constructing a 1,790-mile fence, partially electrified, around Bangladesh. Plans are in place for a mine-lined fence between Pakistan and Afghanistan. Central Asia has seen heightened security too, at Uzbekistan’s borders with Kyrgyzstan and Afghanistan. Russia has a low-security fence lining large sections of its borders with China and Mongolia. North Korea’s land borders are highly secured and the borders of Brunei-Limbang and Malaysia-Thailand are increasingly closed. Australia has extensive maritime security off its northern coast. While south America has seen little change in border security in recent decades, elsewhere the sealing-off of borders to migrants is becoming increasingly popular and globally widespread—movement and access are more restricted in today’s world than ever. Border controls do nothing to solve the problems to which citizens are subjected within countries. They do however impede the age-old strategy of migration to flee from danger or difficult living conditions. People become stuck at, or drift between, impermeable borders, often with no escape to safer counties or access to help or legal protection. There are many hotspots where those trapped by border security become concentrated, often in informal migrant camps—from northern France to north-west Turkey to northern Bangladesh to North Korea, with countless similar scenarios worldwide. This violates article 13 and 14 of the Universal Declaration of Human Rights—respectively the right to freedom of movement and to leave any country and the right to seek and benefit from asylum elsewhere. In most countries, it is extremely difficult or technically impossible to claim asylum from outside, except in rare, specific circumstances. This creates a “catch 22”: the vast majority of states make it illegal for foreign citizens to set foot in the country without a visa, yet tough visa criteria (such as evidence of substantial financial support) make this impossible for many. So to be granted legal stay, most migrants must seek asylum and to do so they must cross the border in an unregulated manner—yet controls makes this increasingly difficult, trapping individuals on the “wrong side”. A new category of crisis migrants is developing—globally dispersed but trapped, in need of refuge and legal and social protection but physically denied access. They are also vulnerable to the violations experienced by those moving through countries irregularly. These include not having access to basic necessities, such as clean water, food, shelter and health care; discrimination associated with their origin and status; exposure to human trafficking, with the associated coercion, deception and physical and sexual abuse; and dangerous or forced labour, as well as organ theft. Border security itself often poses grave threats, such as injury or death at electric fences or violence from border guards. And there have been accounts of migrants being pushed back into the sea or into desert areas, such as in north Africa or Mexico where the risk of dehydration and death is high. As borders become more difficult to cross, migrants are forced to take longer routes around them, their journeys sometimes lasting months or even years. Danger may beckon as they traverse deserts or oceans or travel under lorries: there were 463 migrant deaths in the desert on the US-Mexico border in 2012 alone. And they may have to travel through countries which treat migrants inhumanely. African migrants heading for Europe must often go via the middle east—where they can be caught up in forced labour in Yemen, for example—or Turkey, where irregular migrants if detected are forcibly housed in remote locations, often for many years, their movement highly restricted. The defence and security industry is highly lucrative and one of the largest in the world, its market encompassing state-security projects and infrastructure, including border security. Large business contracts are being agreed between governments and security companies: EADS Defence and Security was contracted by Saudi Arabia to fully securitise all its borders and Libya recently bought a €300m security package from Finmeccanica to the same end. This powerful global industry has a vested interest in ensuring the continued growth of border security. Innovation in the associated technologies, as well as geographical expansion, will increase trapped populations and human-rights violations. As border controls intensify worldwide, more migrants are experiencing such violations and for longer. Yet, as they often seek to avoid detection, disappear among the settled population or go unrecognised due to their irregular status, the struggles of these millions are unrecorded. Innumerable migrants are invisible in society today, effectively existing outside the realm of human rights. Climate change is expected to change demographics and increase migration across the globe, whether through storm surges, sea-level rise or desertification or the complex social, political, economic and cultural dynamics which attend them. The 4C rise or more which could eventuate this century would wreak an environmental and social transformation, surpassing anything we have known in a very short time. While predicting numbers migrating in the context of climate change is beyond current scientific capabilities, huge movement is likely globally. The sealing-off of borders will present serious problems for those seeking safer and more habitable areas. People become stuck at, or drift between, impermeable borders, often with no escape to safer counties or access to help or legal protection. The Sahel region, already experiencing desertification, provides a perfect example. As precipitation declines and its patterns shift, pastoral and seasonal migration offers a coping strategy. But borders, such as Morocco-Algeria and Mauritania-Mali, are becoming increasing impermeable and dangerous, with reports of migrants being shot, sometimes fatally, by guards. Other areas of water stress, predicted to worsen with climate change—such as the middle east and central Asia—are also experiencing sharp increases in border security. The opposite scenario is playing out in Bangladesh, where dangerous flooding is becoming increasingly common and sea levels are set to rise, while the country is being encircled by India’s heavily-guarded border fence. Depending on the extent to which the earth and individual regions warm and the specific effects of climatic change, migration may be the only option for some as adaptation strategies are inadequate or overwhelmed. Yet they could be prevented from doing so, due to border security, and so be trapped in places vulnerable to extreme weather or flooding, and associated food scarcity. The expansion of border security is receiving little or no attention in academic, humanitarian or even political arenas, from a global perspective. And so it continues without question or critical analysis. More debate is needed, outside the military and security domains, to create a common understanding which can inform policy-makers and humanitarian organisations. Research should focus on how and where migrants can gain access to asylum systems, ways to identify and safeguard trapped populations, and hotspots where potential enhanced migration flows will be blocked by securitised borders. We may need to create a common, effective method for migrants to apply for refugee status before they reach their desired destination. This would at least mean that migrants do not get pulled into such long and arduous journeys or become trapped in such dangerous situations, as they struggle to reach safer countries.